Winter sports holidays are available to travellers almost all year round these days – and there’s a huge variety of European ‘winter’ destinations for winter sports enthusiasts to explore and indulge their love of the slopes. In recent years, the winter sports holidays industry has diversified into eastern European countries like Bulgaria, Hungary and Slovenia. Direct flights to some resorts in the US and Canada have made winter sports holidays more affordable. As with all holidays, you need to take into account the expected weather, the winter sports activities you want to take part in and the destination you’re visiting – and this is certainly the case when you’re planning and booking winter sports holidays. You can either take your own skis, snowboard or other equipment, if you’re sure of its safety and quality – or you could choose to hire equipment when you arrive. Most resorts will have a range of outlets where you can buy or hire equipment, as well as experts to help you choose the appropriate kit for you. If you take your own winter sports equipment, make sure that you check with the airline before you fly that there is room for it on the plane! Some airlines, especially the cheaper ones, place restrictions or bump up the cost of your flight if you want to take on ski or snowboard equipment. Your European Health Insurance Card does cover some health emergencies in some European countries, but it’s not going to be any use to you in America or Canada. Even in Europe, the EHIC only entitles you to a basic level of care in – and if you really do injure yourself, and have to be flown back to the UK, beware- repatriation is not included under the EHIC. 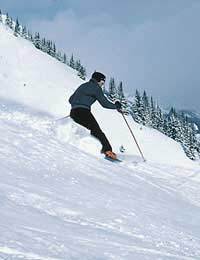 Winter sports holidays need specific winter sports travel insurance because it doesn’t matter how experienced you are, you’re still more likely to injure yourself on a winter sports holiday than you are on a trip to a beach resort or more sedate resort. Winter sports equipment can be expensive to replace if it’s stolen, too. Normal travel insurance probably won’t cover you for all the potential eventualities of a winter sports holiday, so you’ll need to check your existing policy, and look into buying a specific winter sports insurance product to make sure that you don’t get caught out. Even if you have specific winter sports travel insurance cover included in your policy, you still need to check that your chosen sport is one of the sports that are covered. You might be covered for skiing, for example but not snowmobiles. And there could be an excess to pay if you lose equipment or have it stolen. As with all sports and sporting activities, winter sports have rules and regulations in place which protect your safety and everyone else’s. Before you go, get hold of a copy of any rules that apply from your travel agent or tour operator, and distribute them throughout your group of travellers. Check the proficiency level of the resort that you want to visit, and make sure you know your limits! It’s very dangerous to overestimate your ability with winter sports, so practice before you leave, find your level and stick with it!